Nothing says autumn quite like this sweet, tart, crunchy, juicy fruit. While they are commonly eaten out of hand, most apples are great for cooking, too. And few fruits are this versatile: Apples work in all-American or French dishes, and in kid-friendly or super-sophisticated treats as well as drinks. One traditional pairing is apples with pork. The fruit's sweetness complements the meat's savory side, resulting in classic dishes such as pork chops with apple sauce and sausage and apple stuffing. You've probably got apples in your kitchen right now—here's what to do with them. For more on this fall favorite, see our visual guide to apples. When buying apples, choose those without any bruises or soft, mushy spots. They should be firm for their specific variety (a McIntosh will not be as firm as a Granny Smith). Look for fruit with shiny skin—dull skin hints at a lack of crispness and flavor. Apples quickly lose their crispness at room temperature. To keep apples in the fridge, place them in a perforated plastic bag in the crisper. Do not store bruised or cut apples since that will make the other stored apples spoil. To keep apples for an extended period of time, wrap each one in newspaper (don't use paper with colored ink) and then store in a dark, cool place like the cellar or the garage. If you're slicing apples and don't want the exposed pieces to turn brown, dunk the slices in a bowl of three parts water to one part lemon juice. 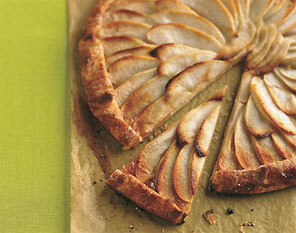 When baking a pie, use a mix of sweet and tart apples to ensure a balanced flavor. I just learned that I can get the flavor of mushrooms without using actual mushrooms. I'm not talking about artificial flavors. I'm talking about powders that are made from fresh mushrooms and are just as fresh as the mushrooms themselves. If you like cooking with dried mushrooms, you'll be very pleased with mushroom powders. Chefs use mushroom powder instead of flour for dredging poultry, fish, and meat. Mushroom powder makes a light and tasty crust, great for veal scaloppini. It also gives body to stews, soups, sauces, and gravies. To make mushroom-coated haddock (or other white fish fillet) for four, brush 4 one-quarter pound fillets with one tablespoon of olive oil and let sit for 10-15 minutes. Combine one-half ounce of mushroom powder with one tablespoon of cornstarch in a plastic bag. Add fish fillets to the bag and shake gently to coat. Heat one tablespoon of olive oil and one tablespoon of butter in a pan. Saute fish until golden on all sides. Dried and ground oyster mushrooms lend a mushroom flavor to eggs, pasta, and vegetables. Without salt or additives, oyster mushroom powder is as healthy as the mushrooms themselves. Oyster mushrooms have a faint, pleasant licorice smell and a mild peppery or oyster-like flavor. You can jazz things up a bit with oyster/herb seasoning. It's great for dips. Just mix the mushroom seasoning with cream cheese and parsley. Or sprinkle it on a salad and you will taste the mushroom flavor. A tablespoon of seasoning added to a softened stick of butter turns a plain baked potato into a gourmet treat. Porcini mushroom powder has an intense and robust nutty flavor, just like the mushrooms. For a simple, versatile sauce, mix one tablespoon each of porcini mushroom powder and chopped fresh rosemary with four tablespoon toasted pine nuts. Great with chicken. Chanterelles have a light, fruit flavor, and so does chanterelle powder. Shiitake mushroom powder is made from high quality cultivated mushrooms, using only the caps. The warm, earthy flavor is perfect for fish, garlic bread, soups, gravies, and stir-fries. Mushroom powders also have medicinal uses. Research indicates that a blend of mushrooms can stimulate the immune system more than any one mushroom. A blend of mushroom powders will be rich in glycoprotein and antioxidants. As a dietary supplement it can be mixed with water, juice, or food. Certain mushrooms have been used for centuries to treat asthma and tuberculosis and as laxatives and purgatives. Traditional Chinese medicine uses oyster mushrooms powder for joint and muscle relaxation. Oyster mushrooms are also thought to be a good source of niacin, riboflavin, protein, and iron. Of course, anyone wishing to take mushroom powders for medicinal purposes should check with his or her medical provider first. You can purchase mushroom powders from local sources that grown their own, from national companies that make powder from imported mushrooms, or directly from the orient. Mushroom powders can last up to two years, but this varies according to mushroom type and how the powders are stored. When you need a quick, easy, and healthy entree for your family meals, try this Salmon Croquette recipe that is made with corn flake cereal. With this recipe you have seafood, grain (corn flake crumbs), egg, and vegetables (celery and onion) in each croquette. Now that is a healthy entree. Fry in canola oil which is an oil that is better for your heart than most. In a medium bowl, combine the salmon, egg, half the corn flake crumbs. Mix well and set aside. In a 1-quart saucepan, melt the butter flavored shortening. Add the celery and onion. Saute over medium heat until tender. Stir in the flour, salt and pepper. Blend in the milk. Cook and stir over medium heat until mixture thickens and bubbles. Remove from the heat. Blend milk mixture into the salmon mixture. Shape scant 1/3 cupfuls into cone or ball shapes. Roll in the remaining corn flake crumbs to coat. In a deep fryer or a deep skillet pour enough oil to about 2-inches in depth. Heat oil to 350 degrees. In the hot oil fry a few of the salmon croquettes at a time for about 3 minutes or until golden brown. Turn once or twice during cooking. Line a cookie sheet with paper toweling and place croquettes on the paper towels to drain. Serve immediately or keep warm in the oven at 175 degrees. NOTE: You can make Tuna Croquettes by substituting a can (12 1/2-oz) tuna for salmon. This Saturday marks the start of Oktoberfest, the world's largest beer festival. The main event takes place in Munich, Germany, but celebrations take place around the world in countries as varied as Brazil, Canada, Ireland, Australia, and the United States. To learn the story behind this annual event (including why it starts in September) and for a list of some of the best stateside celebrations, read our Oktoberfest feature, Welcome to the Wies'n. Beer may be the focus, but German food, especially sausages, is an important part of any good Oktoberfest. Don't know the difference between knockwurst and bratwurst? We spoke to sausage-maker Bruce Aidells who gave us an overview of the major German sausages, suggestions for what to serve them with, and his favorite online sources. Hosting your own Oktoberfest or looking to prepare some authentic German dishes (think Beer-Braised Sausages, German Potato Salad, Spaetzle, and Sauerkraut)? Check out our Oktoberfest recipes and menus. For new cooks, the prospect of hosting your first dinner party may seem daunting. You may be intimidated by the chefs you see on TV shows and feel you can't prepare the kinds of meals that they do. Don't worry; you don't have to. As a personal chef, I used to spend a great deal of time cooking in someone else's kitchen. On occasion, a client would ask me to cater a small dinner party or a special event. I learned many lessons from my first dinner party when I realized how different it was from preparing and packaging two week's worth of meals and leaving them in the freezer. Fortunately, it wasn't a total disaster. I hope the following tips will help you have a successful party that you and your guests will enjoy. Stress-free entertaining requires planning and practice; however, keeping things simple will go a long way toward easing your anxiety. For your first dinner party, invite no more than 4-6 guests. Even six people can be pushing it and become overwhelming for your initial adventure. Suppose everyone decides to mingle in your kitchen? Would you feel comfortable? If you are culinarily challenged, look into alternatives to the traditional dinner party. You could have a pot-luck meal and suggest recipes for your guests to bring. Or, get restaurant take-out and dress it up with your own personal additions. Plan a simple meal with no more than two or three items. Add hors d'oeuvres and dessert if you like. I suggest cooking something you like or feel comfortable preparing. You do not have to cook everything yourself. There are many quality products you can buy from a gourmet or specialty shop that will complement your homemade dish. Your first dinner party can be fun for you and your guests. The more you practice, the more confidence you will gain. If something does go awry, laugh it off and your guests will, too. In the end, it may just become a golden memory you will laugh about for years to come. Want to get some great ideas for some simple popular recipes to cook for your first dinner party from the best American restaurant menus in the country? Click here if you love cooking and yet are still new and unsteady about your cooking skills, you can learn step-by-by step how to make the secret recipes from YOUR FAVORITE restaurant! America's most wanted recipes are found in America's Secret Recipes. Sure a frozen dinner is rarely our first choice, but it DOES serve a purpose. For when the moment hits, we here at Hungry Girl have a handful of diet-friendly favorites that we want EVERYONE to know about! Ladies and gentleman, this is the best frozen meal EVER. Packed with things like plantains, pumpkin seeds, sweet potatoes, insane grains, and an incredible smoky-sweet sauce. Not only is it wholesome and delicious, this is one creative entree! We would eat this any day of the week... maybe even a few days in a row. We try not to be swayed by clever marketing alone, but we DID have to give HC's new meals a try when Julia Louis-Dreyfus started hawking them. And they're REALLY good! The chicken in this dish is tender and delicious, and the sauce is REALLY creamy! And there's a little old-school apple-cranberry dessert that tastes like the holidays. Nice touch! Forget about hitting Mickey D's on your way to work -- an Egg McMuffin's got nothin' on this sandwich. Whole grain goodness, lean but tasty sausage, egg whites... please! Just throw one of these things in the microwave before you run out the door, and you won't have to worry about how many times you'll have to repeat your order into the drive-thru speaker. Instead of ordering from the local Chinese restaurant (we always end up getting more food than we need), we suggest keeping one of these meals on hand. It's GREAT, the sauce is AMAZING, and the veggies are crisp (not soggy at all). SCORE! Plus, there's really more sauce than you need, so you could even add some extra frozen veggies or Tofu Shirataki noodles to the mix! Finding a frozen meal that's not packed with sodium is pretty uncommon. Finding one that also tastes good, is packed with fiber, and is totally reasonable in the calorie and fat departments? An urban legend. Until now. This dish has more than 20 organic ingredients (so it has lots of flavor), and salt isn't on the list. Good work, Organic Bistro! Look for these meals at select supermarkets such as Whole Foods. Most pre-assembled stir-fry meals that come with sauce and meat usually include rice or noodles. Not these! Contessa meals, where have you been all our lives? Throw a bagful into a pan, heat it up, and you've got dinner without all the starch. The sauce even comes in a separate pouch, and it only adds about 60 calories. Perfection! That's right, it's Lean Pockets, the calorie-conscious little sister of Hot Pockets. This appeals to our love of junk food and cheap hamburgers. One taste of this and we were reaching for pickle slices to shove inside it. Sure, it may not be considered "healthy" food, but if you were going to reach for a Big Mac anyway, this is a tasty alternative. Speaking of frozen...check out these Guilt-Free Answers to Ice-Cream Cravings. Combine ingredients in a bowl and keep chilled until ready to serve. Blanched fresh broccoli, cauliflower and carrots are excellent with this dip. Leftover dip can be tossed with chilled cooked red potatoes for an interesting salad. Place flank steak in a sealable plastic bag or a non-metallic container. Combine the remaining ingredients well in a food processor or blender and pour over the steak. Marinate for 1 to 4 hours. Grill steak over high heat for 4 minutes on each side for medium rare. Let cool for 5 minutes before cutting in thin diagonal slices. Combine sesame oil, honey and soy sauce by hand or in a food processor or blender. Pour over zucchini in a sealable plastic bag or non-metallic container. Preheat grill to medium-high and cook zucchini for 4 minutes on each side or until tender. Before dinner, combine mango with the raisins and rum in a bowl. Cover and refrigerate. At serving time, spoon sorbet into bowls and top with the mango mixture. Are you ready for some football? Fans of the NFL, and those folks who root for their favorite college team can enjoy this football inspired gourmet club theme. The ideal spot for this dinner club get together is somewhere outdoors – perhaps one of the members has a large yard or a freshly mowed field. A local park will work as well. And, for die hard fans, the ultimate setting for this gridiron picnic is the parking lot at the stadium. A tail gate is not a must for a football themed picnic. But if the gourmet club members drive station wagons, SUVs or hatchbacks, the tailgates are built in. Park the vehicles and open them up for instant serving and dining. If the picnic is taking place on property owned by a member of the club, he may agree to an outdoor fire. The smell of wood smoke on an autumn day hints at colder weather to come. It can even be used for cooking food. If the wood fire is not possible or ideal for food preparation, break out the portable grills and/or the propane camping stoves. Picnic tables can be covered with traditional red checked oil cloth or, if the party is taking a more formal path, linen might be the logical choice. The group may decide to be casual with paper plates, napkins and plastic cups and utensils or, the host might prefer – and provide – china or more informal pottery plates accompanied by silver or stainless steel forks, knives and spoons, cotton or linen napkins in napkin holders and glass or crystal wine glasses Candles, flowers, place markers, (miniature pumpkins sporting each guest’s name are one idea for these), can be added. With a tailgate party/fall picnic, just about anything goes. Depending on the parameters the group has agreed on, the host for the fall gourmet meeting, (in the north, north west and north east, this theme works especially well in October or November when the chance of true football weather setting in adds to the ambiance), will probably be responsible for the main course and accompanying beverages. The host may assign the remaining courses to the other members complete with recipes or the other members may choose their own courses and recipes but whatever the overall plan, the tailgate menu will be created prior to the meeting date. This suggested menu is a favorite of a long standing gourmet group. The group members are rabid football fans who enjoy a yearly fall picnic with a gridiron theme. Their setting is casual with an eye toward enjoying each other’s company rather than trying to impress with gourmet food choices. Appetizers: Zucchini cilantro dip is a delicious and perfect way to use the last of the zucchini from the garden and a basic cheese, fruit and cracker platter sets the stage for heartier fare to come. Main Course: “Walk Around Chili” is designed to free folks from the confines of the table – spooning hot chili into single serving bags of corn chips is both filling and yummy. It warms from the inside out making it just the thing to combat autumn’s subtle chill. Hearty toppings add another satisfying layer. Side Dishes: A cole slaw combats the chili’s heat. There are many combinations to tempt the palate – apple, cabbage and even carrot can be a tasty addition to any autumn meal. For crunch, toasted pumpkin seeds are the ticket. They can be sprinkled on the slaw, the chili or eaten right out of the hand. Desserts: One way to top off the tailgate menu is with a football shaped cake in the colors of the host’s team of choice. The member in charge of the cake may choose to take on the challenge of baking and decorating it themselves or may order it from a bakery. Since the cake is potentially the most expensive course, the other gourmet club members will chip in. S’mores are a popular choice if there is a fire. And homemade apple brownies reflect the season. As with any dinner club gathering, the goal is enjoying good food with good friends.